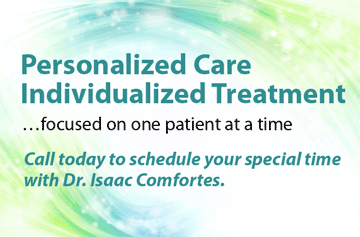 Dental Cleanings & Preventive Care - Dr. Isaac Comfortes, D.D.S. Total Health Dentistry of Encino is committed to your long-term dental health and beautiful smile. While Dr. Isaac Comfortes offers a full range of restorative and cosmetic procedures, his first goal is to prevent dental problems in the first place. Routine dental cleanings are one of the most important ways to protect your oral wellness. At each appointment, our registered dental hygienist will remove the microbes, plaque, and tartar that cause cavities and gum disease. Most people realize their body’s health is affected by the foods they eat and the presence or absence of oral disease. 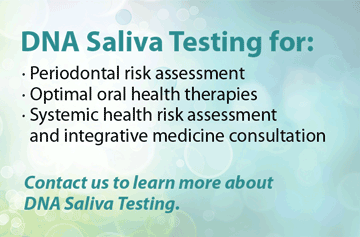 Dr. Comfortes offers oral Oral DNA Saliva Testing in Our Office to ascertain your risk of periodontal disease and the presence of specific periopathogenic bacteria. Once these have been determined, we can help you better eliminate inflammation in your mouth and the spread of bacteria and inflammation throughout your body. Health-conscious patients are delighted with the availability of this relatively low cost diagnostic because chronic gum disease is a contributor to cardiovascular disease, diabetes, arthritis, inflammatory bowel disease, kidney and liver disease, obesity, head and neck cancer, neuro-inflammatory diseases, preterm birth and more systemic health problems. Health-conscious Californians who want their smiles to remain young can stay on top of any developing gum inflammation. Your mouth contains thousands of bacteria. While some of these microbes can actually protect your oral health, others will eventually lead to decay and gum disease. As bacteria build up on your teeth, a sticky film called plaque will develop. Eventually, plaque will harden into tartar. Both of these substances will keep bacteria in contact with your teeth. The microbes will feed off of the sugars and starches in your food. Together, bacteria and carbohydrates will form acids. The acids will erode your dental enamel, giving bacteria access to the deeper layers of your teeth. As the bacteria progress, a cavity will develop. A buildup of oral bacteria will also lead to gum disease. When microbes accumulate in your mouth, pockets will form in your soft tissues. Bacteria will multiply and the pockets will grow larger. Without treatment, you will eventually suffer discomfort, gum recession, and tooth loss. The good news is that we can effectively diagnose and treat gum inflammation and other diseases of the mouth to optimize your well being! Oral bacteria can seriously compromise both your oral and systemic health and the appearance of your smile. Of course, proper home care is required to limit bacteria, but even meticulous brushing and flossing cannot fully prevent the development of plaque or tartar. Therefore, it is essential to receive regular cleanings from a dental professional. Our hygienist will thoroughly remove these substances at each of your dental cleanings and then polish your teeth, giving them a beautiful, healthy smoothness. In addition, at each cleaning, we will conduct a dental exam and oral cancer screening. Routine care can often prevent decay and other concerns. However, through regular checkups, Dr. Comfortes can identify these problems if they do occur. Our team offers personalized care and gentle techniques. Though our cleanings are typically comfortable, we know that you may feel nervous about visiting our office. 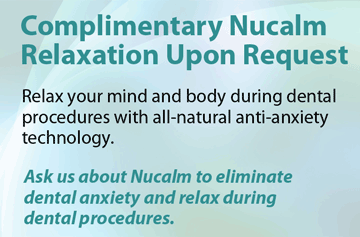 If desired, we can provide NuCalm™ to help you relax. This all-natural treatment combines music, microcurrent stimulation, and a nonnarcotic relaxation supplement that is rubbed on your neck at the carotid arteries, where it enters your blood stream and reduces the effects of adrenaline. Thanks to NuCalm, you can receive the care you need to protect your smile. You have a history of frequent decay. You have already been diagnosed with gum disease. You have a personal or family history of oral cancer. You have an autoimmune disease that increases your risk for periodontitis. If you want to enjoy full oral function, a beautiful smile, and a healthy self-esteem, dental cleanings are essential. Let us help you maintain a healthy, clean smile and determine the frequency of dental cleanings and checkups that is optimal for you. 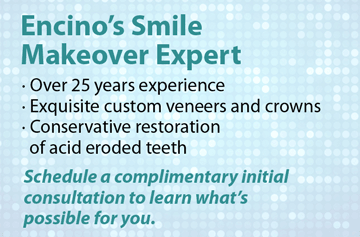 To schedule an appointment, call Total Health Dentistry of Encino at (818) 990-9101.